Home > Products > Rally Point Volume 13: The Yanks Are Coming! 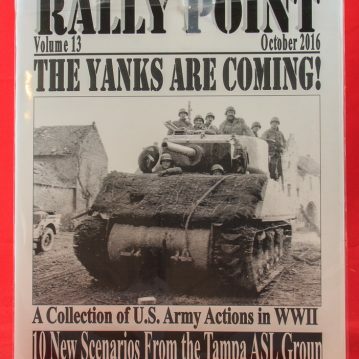 04.2017 Rally Point Volume 13: The Yanks Are Coming! 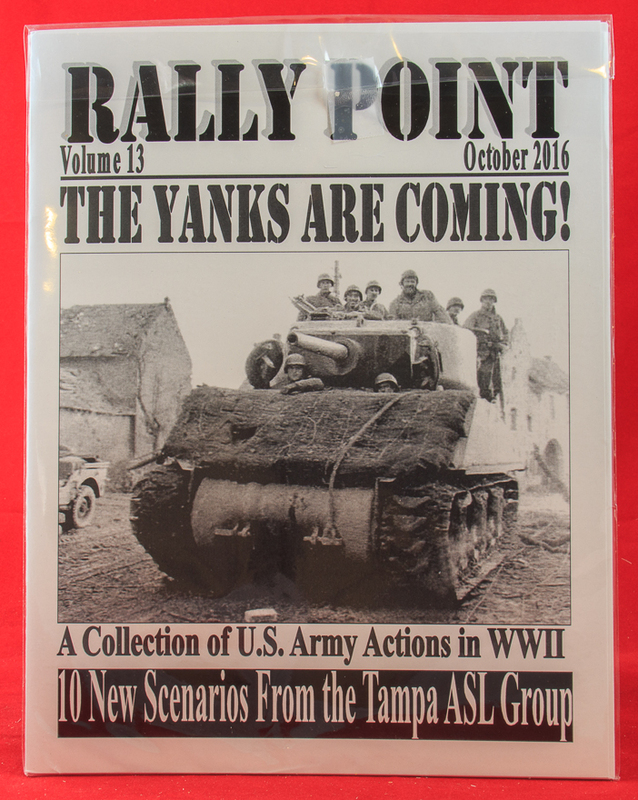 Released at ASLOK 2016 was Schwerpunkt’s themed scenario pack, Rally Point Volume 13, dubbed “The Yanks Are Coming!” The product’s theme was designed to take advantage of MMP’s recent release of a new edition of core module Yanks. All of Volume 13’s scenarios feature the Americans. However, the range of scenario situations is extremely limited. 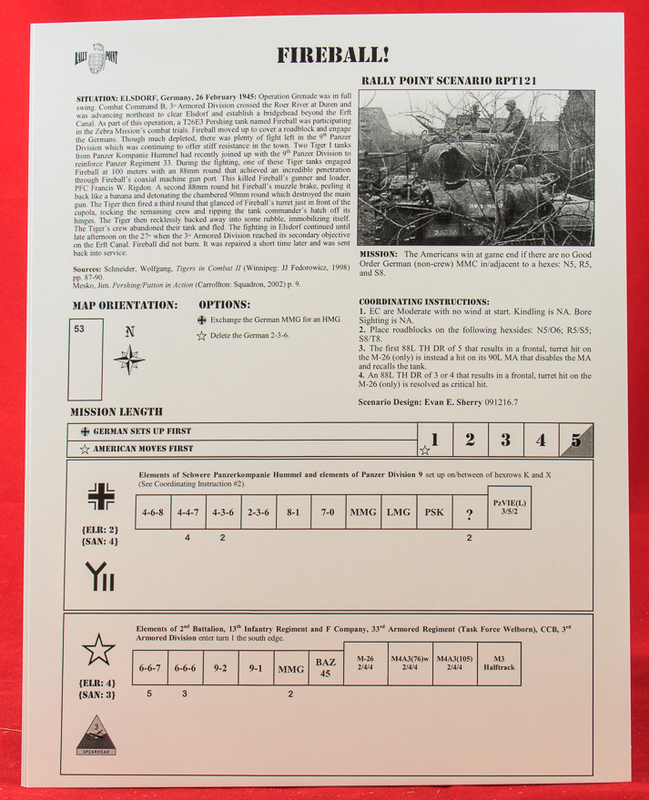 All but one of the 10 scenarios take place in Belgium/France or Germany during the period October 1944 to May 1945, the lone holdout also taking place during that time frame but in Italy. Schwerpunkt thus continues its overemphasis on late war scenarios. Absent are actions involving U.S. troops from North Africa, Sicily, almost the entire Italian campaign, or any at all against the Japanese. Thus the variety of this scenario pack is fairly limited. The scenarios in the pack tend towards the small, breaking with a recent Schwerpunkt trend towards larger scenarios. About half of the 10 scenarios are small, with the rest divided between medium and large in size. None are huge. One scenario uses OBA; no scenarios utilize Air Support or Night rules (has Schwerpunkt ever done a night scenario?). As is typical for Schwerpunkt, there are few SSRs; scenarios are largely distinguished from one another by differing OBs. To play all the scenarios, the following maps are required: 5, 17, 17z, 49, 50, 52, 53, 67, 70, 71, 72, 2a, 3b, 5a, 5b, 6b, and ASLSK board u. As a designer, Evan Sherry often seeks variety not through flavor SSRs or victory conditions but through unusual or underutilized vehicles. Thus RPT121 (Fireball!) features a Pershing tank, while RPT124 (The Undaunted) gives the Americans several Chaffees and an on-loan British Sherman Crab. RTP123 gives to the Americans an M36B1GMC Tank Destroyer. RPT126 (The Steinstrass Funnel) also features a couple of Sherman Crabs. RPT127 (Saurians at Suggerath) has two AVREs and four Crocodiles. 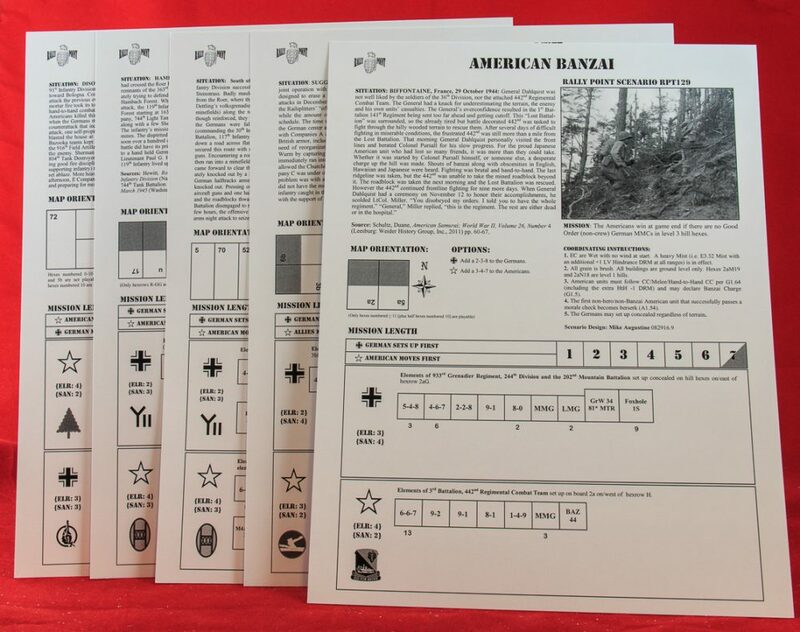 RPT129 (American Banzai) is a scenario that features the (Japanese-American) 442nd Regimental Combat Team, the much-heralded Nisei unit, and gives the units in the scenario the ability to conduct Banzai Charges–not because the troops were Japanese but because of the action depicted in the scenario.